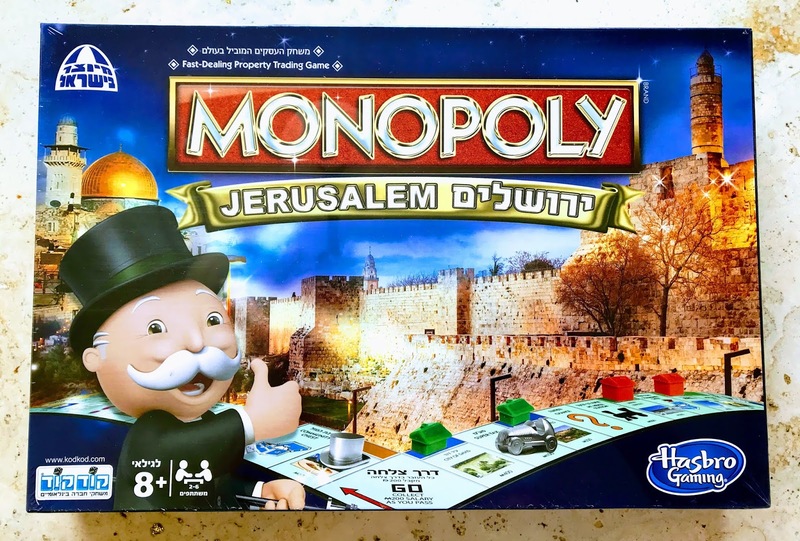 I am so excited to play this edition of Monopoly Jerusalem edition. The properties of obviously from famous places in the Holy City of Jerusalem, such as The Kenneset, Mount Olives, Mount Herzl, Hebrew University, Montefiore Windmill, Mahane Yehuda Market, The Biblical Zoo, The Israel Museum, Tower of David, and of course, The Western Wall, and more. The cards are in both Hebrew and English so I can continue to improve my Hebrew language skills. I think this is a perfect topic to be thinking about today, which is Tisha B'Av (the 9th day of the Hebrew month of Av). This is a perfect Shabbat game for after Shul and Kiddish, and I am looking forward to the family sitting down to play Monopoly Jerusalem style.